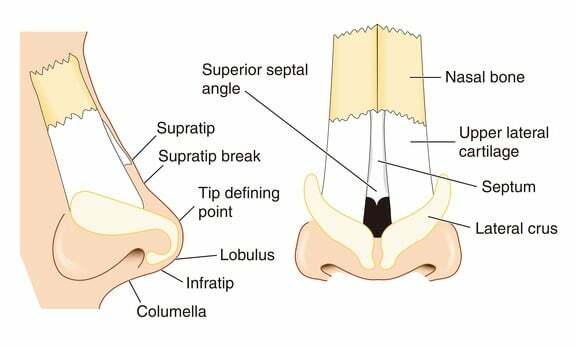 This blog is about specific aspects of rhinoplasty. The last blog was a general approach to the benefits of improving the appearance of one’s nose. In order for a surgeon to offer a comprehensive accurate and predictable result he or she must have a complete and thorough knowledge of the anatomy and physiology of the nose. Once this comprehensive knowledge is internalized in the surgeon and he or shehas performed many rhinoplasties over the extent of his career thesurgeon becomes more predictable in his ability to offer patients a reliable and predictable result. Keeping in mind that our goal is to create a nose that fits their specific face and is not to create a nose that looks like all the previous rhinoplasty results nor has expectations of reproducing it in the future. Of all the operative procedures offered by plastic surgeons rhinoplasty is by far the one that requires the most preoperative vision ,planning, performance, and follow-up. We learned over time that results in rhinoplasty continues to evolve over the years. Therefore it is important that the preoperative planning take into account this fact. As we have asserted in the past the nose anatomicallyis comprised of skin, cartilage bone- and the intervening connective and subcutaneous tissue. It also has a mucosal lining internally. Surgical intervention and rearrangement of these anatomic structures must be very precise and follow the preoperative planning in that fashion. The early rhinoplasties were done through an incision on the outside of the nose. Then over time it became apparent that these anatomic changes could be performed through an internal nasal incision––this has become known as the closed technique. The closed technique therefore refers to the incision made inside of the nose. This surgical approach is much more challenging than the external approach but offers profound and significant benefits in so far as the early resolution of the swelling and its associated distortion. Therefore the purpose of this blog is to assert the distinct advantage of the closed technique––which I prefer. one handy wordpress plugin and increase targeted traffic many times.